When do you race at the Manly Warringah BMX Track? Our canteen will be open during racing. My Child wants to Race. What do i need? Full sleeve shirt and pants. Gloves (the club has several that can be borrowed while trying the sport). We also highly recommend elbow and knee pads to reduce falling injuries. Sign on and pay the $7 race day fee. BMX is a unique family sport. Mum and Dad bring your bikes down and you can also race. My Child wants to Race. How should we start? Our track is open to the public when we are not using the track. If your child can ride around the track they are ready to start racing. Check our Club Calendar for Race dates. Kids are usually put with kids with similar abilities when getting started. We have a sign on desk on race days. Here you can ask more questions, purchase a license and sign up to race. How old does my Child need to be to Race? There is no age minimum, however the rider needs to be able to ride around the track on their own. Typically BMX riders start at the age of 4 years old. It is $8 per rider to race at our clubbies. ($20 max per family). BMX Licenses, How much and where can i purchase? To ride (and do training) a valid BMX license is required (to cover insurance costs). Do I need a BMX Race Bike? No. Before going out and spending hundreds of dollars on a proper race bike we highly recommend that your child starts with any bike. Race bikes are very light and will be a lot faster than a standard bike. However they typically start at about $400 for a new bike. So we recommend your child uses any bike. If they enjoy the sport then look at purchasing a proper race bike. If looking for a new race bike we highly recommend BMX Mafia at Gladesville. Let Terry know that you are a Manly Warringah member and you will get a great deal. Do i need to do anything to my bike to race? Check that the bike is fully functioning and is safe to ride. Typically the front brake on a bike is removed. Remove any reflectors, baskets or any items that may be sticking out on the bike. What size bike should my Child Have? This depends on the size of the child but here is a very rough guide to bike sizing. Please get your bike shop to recommend the correct bike size. What is the difference between a Clubby and an Open? 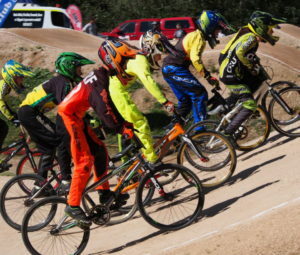 Most BMX clubs conduct their own racing at their track weekly or fortnightly. These are called ‘clubbies’ and normally consist of 5 fun moto races. Most clubs run a points series over the year and award prizes at the end of the points series. 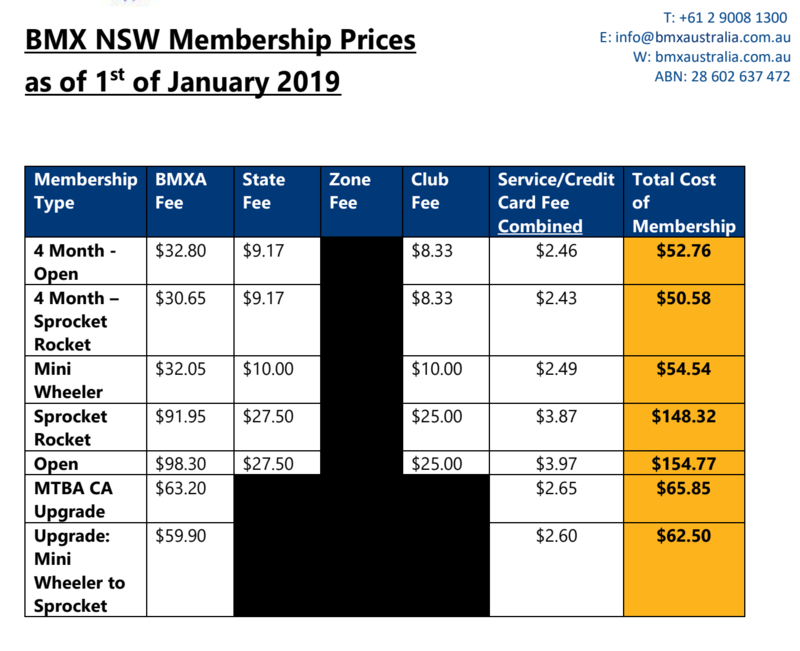 Every two or three weeks a club in NSW will host an Open. All riders from the state are invited to attend these events and they usually offer small prize money. See our club calendar for clubby and open race dates. Most riders start with just riding clubbies. If you are looking for the ‘next level’ of competition they will then start trying Opens. In Australia all riders 7 years or younger are classed as Sprockets and require a ‘Sprocket’ license. When they turn 8 they will be upgraded to a Open license. Note: If your child is 7 but is turning 8 this year; Then you require a sprocket license as they are 7. But as they are turning 8 this year they will actually ride as a ‘Under 8 year old’ so they do not race as a Sprocket even though they still have a ‘Sprocket’ license. (Yes very confusing). What age group does a rider ride at Clubbies and Opens? In BMX we group the riders by the age they turn this year. So at Opens you ride the age you are turning. At clubbies we try to group riders based on ability. We offer both novice and age groups to roughly grade riders. Do you provide coaching and training at the club? Yes, we do! Please see Who wants to be a BMX champion? for further details or contact us at admin@manlywarringahbmx.com.au. A standard BMX bike has 20″ diameter wheels. There is also a separate class called ‘Cruisers’ which are bikes with 24″ diameter wheels. It is the riders preference and you can ride either at clubbies and opens. Do I Need a Number Plates? To race you need a number plate. We sell number plates at our sign on desk for $15. You may select any number between 9 and 999. (Numbers 1-8 are reserved for the top 8 riders in the state, country and world). Male 20″ Riders (8 and Over) – require a Yellow Number Plate with black numbers. Male and Female Cruisers (24″) – require a Red Number plate with white numbers. Who maintains the Manly Warringah BMX Track? The track is maintained by the Club which is run by the parents of riders and volunteers. The council does not assist us with any maintenance however we do occasionally receive grants and help from the local government which helps us maintain improve our facilities. The club relies on fund raising and race entry money to cover track maintenance costs (soil, machinery etc). Before racing we kindly ask parents to arrive early and assist with raking and grooming of the track. The amazing facilities at Terrey Hills are there for all to enjoy, but please respect the hard work that’s done by volunteers to make it as great as it is and do not ride when the track is wet or if it has been raining. Club members racing an an open event.